"The pressure comes from within. I wanted to put on a good show and make sure we represented women well," said Paige Alms, shown here, winner of the Pe'ahi Women's Challenge. On Friday afternoon, Keala Kennelly watched on the tiny screen of a borrowed cellphone as her friend and competitor Paige Alms won the Pe'ahi Women's Challenge at Jaws, Maui's famed big-wave break, and captured the inaugural World Surf League women's Big Wave Championship. A few hours earlier, in the first heat of the women's contest, Kennelly caught the opening wave. It was the first surfed by a woman in a WSL big-wave contest, and it received the highest score of the day. On her second wave, Kennelly lost her balance navigating bumpy surf and felt the lip of a 30-foot wave crash onto her back leg. An MRI fortunately revealed no torn ligaments, but she was unable to surf in the final for which she qualified. As the first woman to tow into a wave at Teahupoo, the first woman to paddle into a wave at Nelscott Reef and the first woman to win an XXL Big Wave award in a previously male-only category, Kennelly, 38, is one of the most influential and respected women in big-wave surfing. Alms, 28, is the next generation. In 2005, she became the first woman to get barreled at Jaws, her home break and a wave she's surfed since she was 14, and was called the best female big-wave surfer by Surfline. She lived up to that billing on Friday, catching more waves than any woman in the event and surfing with confidence and poise on a windy, treacherous day at Jaws. The day after competing in this historic event, espnW caught up with both women, who were already asking, "What next?" espnW: What was the vibe like when you all arrived at the beach Friday morning knowing you'd surf in the first WSL women's big-wave contest ? Paige Alms: Everyone was so supportive. I was so happy to see that all the girls showed up and were charging. Keala Kennelly: I was more relaxed than ever for a contest. I was Zen. I've been living in California. I was just so happy to be in Hawaii and back in warm water. I was excited to surf anything over 4 feet. I was hyped to be able to paddle out without 60 guys in the lineup. 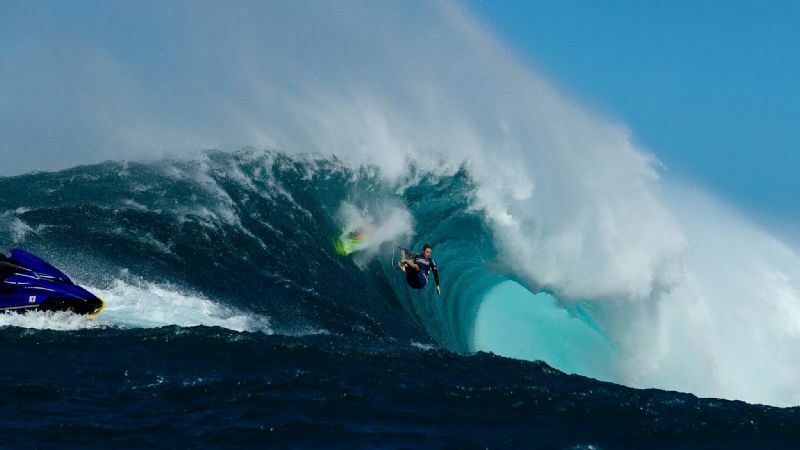 espnW: What was it like to be out at Jaws with only women, and so few people, in the lineup? PA: Even when we're free surfing at Jaws, there are usually only one or two women in the lineup. The most there's ever been at once was four or five girls. To have six of us out there in a heat with no one else in the lineup, we all felt the same way: This is awesome. If there are 60 guys in the lineup, you don't catch a lot of waves. We were all glowing and proud to be out there together. 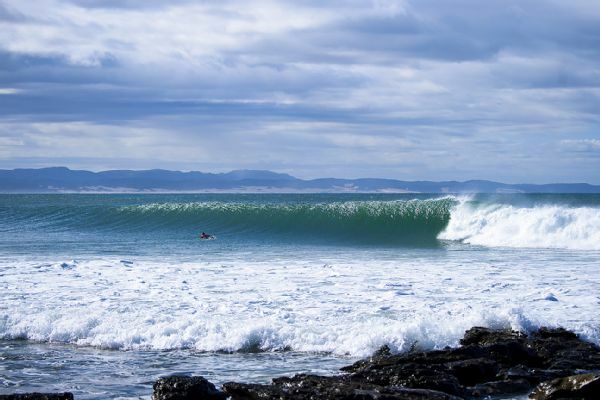 Win or lose, having an empty lineup at your home break, one of the best big waves in the world -- nothing tops that. Paige Alms surfs Jaws, Maui's famed big-wave break, during Round 1 of the Pe'ahi Women's Challenge. espnW: Paige, because Maui is your home break, did you feel more pressure on you to take the win? PA: The pressure comes from within. I wanted to put on a good show and make sure we represented women well. That was the pressure for me. It wasn't about winning the contest. My friends tried to put that pressure on me. But it was about having those empty lineups, choosing the waves you want with other girls. When I won, I felt like I won for everyone. espnW: What was it like to have so many women competing at a break at which you both have been such pioneering surfers? PA: Only half the 12 girls had surfed Jaws before this contest, and the other half of us were nervous for that. I know how powerful this wave is, but not knowing is almost better. Those girls showed up and sent it. I felt pride for the girls. KK: Windy Jaws is treacherous, so my hat's off to all the girls who went out and took a wave. espnW: Speaking of wind, the conditions looked incredibly windy on the webcast. How bad was the wind? PA: It was very challenging. It matched the name of the contest, The Pe'ahi Challenge. The wind was gnarlier than it looked at home. When it's windy like that, it becomes really dangerous. I don't usually surf it when it's windy. The risk isn't worth the reward. KK: I was excited when we left the harbor. But on the boat ride out, you can tell if the wind is going to be an issue. As the water got choppier, I could see the wind was going to be an issue, and that gets scary for me at Jaws. It becomes really dangerous because the wind gets up under the board, holds you up at the lip, doesn't let you in and releases your fins. It ups the danger so much. It was intense. 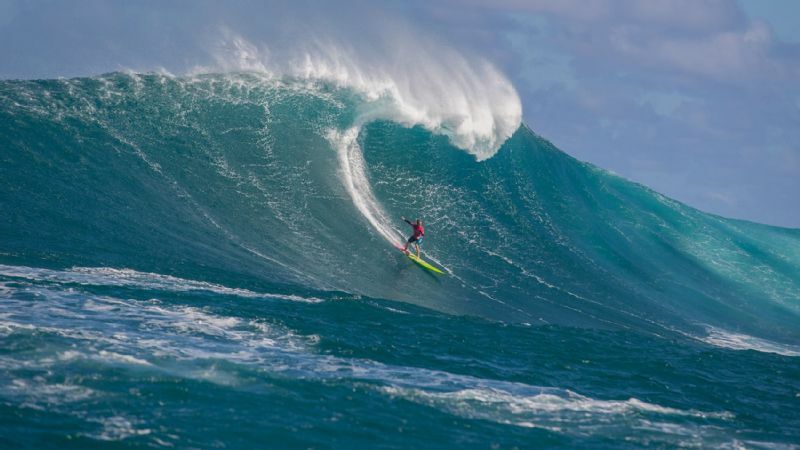 The wind during the Pe'ahi Women's Challenge made the conditions "really dangerous," Paige Alms, shown here, said. 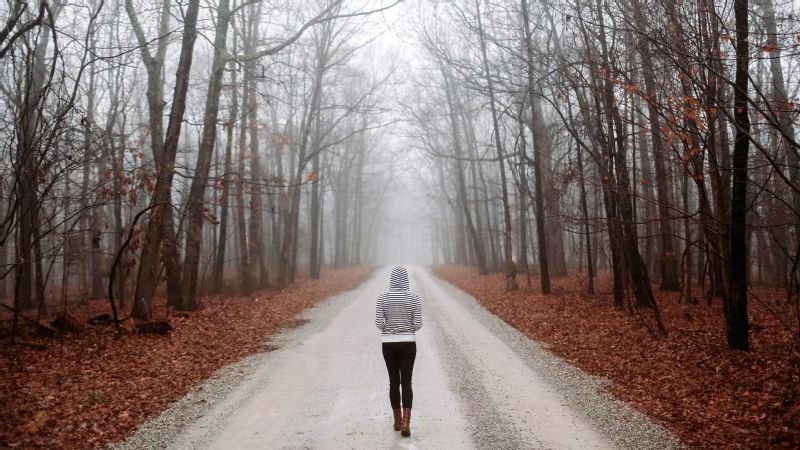 espnW: Knowing that, how do you find the confidence to paddle out and make the decision that it's worth the reward? PA: When the stadium is set and you know you have to go out, you go. 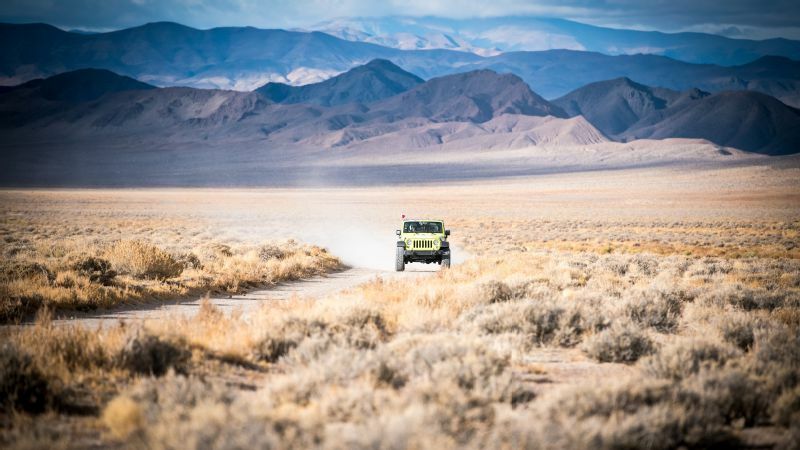 We had a moment when I heard there would only be three of us in the final [after Kennelly, Laura Enever and Emi Erickson qualified into the final but pulled out due to injuries], and some girls asked if we should postpone the event or push it to the next stop on tour. I was like, "No. We are here to surf, to do the job they invited us to do." If we didn't step to the plate, it would make women's big-wave surfing look bad. The conditions were tough, but it's still the best big wave in the world, even when it's windy. We are going to do it now. It was game on for all of us from that point. KK: Paige did such an amazing job and sent it. She went out there and earned her victory and carried it for the women. But Paige is a true sportswoman and she was bummed I wasn't in the final. We love and respect each other, and Paige definitely wants me out there. But she is so deserving. Paige let people know that we deserve to be there. espnW: What do you think happens from here? 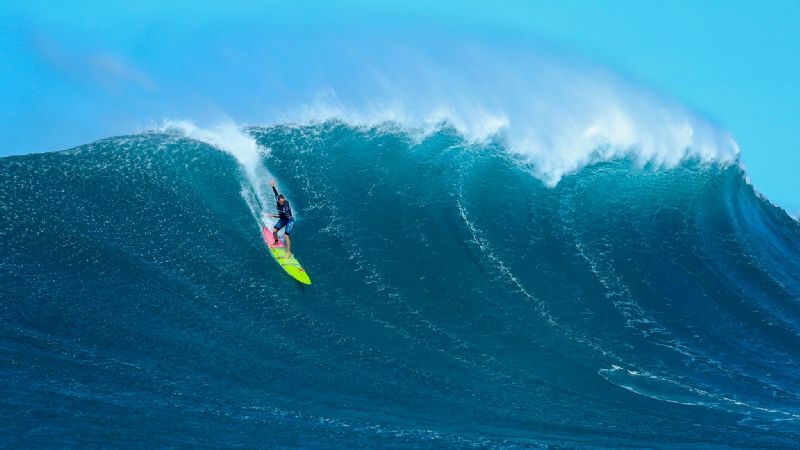 Is this the first of many big-wave events for the women? PA: That's the goal. This is the first of its kind, the first time they gave us this opportunity. This is my home break, where I grew up and learned to surf big waves, and I felt obligated to put on a show to show the world we know how to surf this wave. That's where the pressure came from. Now that we showed that, I hope the WSL will add more events. Maybe we can talk them into having the Todos women's event. It would be rad to have an event at all the big wave stops. KK: It was an honor to compete, and I was stoked for the opportunity. It's not the way I wanted it to go down, but I'm proud of the wave I rode and proud that I got the highest score. And I am excited for next year. There will be a next year.